There comes a time in every aspiring screenwriter's life when they discover The Unknown Screenwriter. For many, including myself, it's the moment they happen across a much-needed blog post filled with juicy, rant-y, truth bombs about the craft and business of screenwriting. For others, it's finding his prolific and interactive Twitter feed. (If you stick around long enough you'll surely get a shout out.) The presence of Unk, as he's affectionately known - though I'm sure he'd stare affection in the eye until it slunk away defeated - has brought me both comfort and unease over the years. There is no sugar-coating with Unk when it comes to the industry and the unforgiving structure of screenwriting, but there's always humor, surly charm, and hellluva lot of insight. Unk, how would you define creativity? Hard work. Long rides. Long drives. Daydreaming. New. Valuable. What if? Pushing the limit. Living on the edge. Luck. Explain to those who don't know you - actually, even to those who do - a brief history of your anonymous screenwriting persona. Brief... Okay. I was reading screenwriting blogs back in 2005 for no other reason than because I like screenwriting and there was nobody I could sit around have conversations about screenwriting with. And while I found some interesting sites, I kinda felt that most had very similar ways of looking at the craft similar to what you'd find in a book or article. And while there's nothing wrong with that, I wondered if sharing my own perspective might work for some of those who are tired of the usual perspective that seems to be out there in droves. I work with a production company and we make films but we also do script consulting on studio and larger indie films. We fix screenplays... Movies you've either seen or heard of. We do this for absolutely NO CREDIT -- just pay -- and business is good since the meltdown because everyone wants to keep their credit. Hence, Unknown Screenwriter. How did you get involved in screenwriting? No different than a lot of people... Grew up loving movies. I never really thought, "I could do that," or I can do better than that..." I was always thinking, "I WANT TO DO THAT!" Just started writing with abandon in the 80s. I had absolutely no idea what I was doing. Bought a couple of screenplays of my favorite films, BLADERUNNER and THE THING. I still have those two scripts today and read them at least once a year. Between the mid 80s and early 90s, I wrote but I wrote for myself because I was trying to become a filmmaker -- not a screenwriter. I was inspired by John Sayles, actually. I figured out very early on that if I was going to make my own films, I needed to know how to write. So while I had several completed scripts lying around, I knew they were for ME and not for the market. In the early 90s, I finally sat down and wrote my first screenplay that I hoped would sell. This was at the beginning of the Internet and I used email for querying producers. Back then, a lot more producers were willing to post email addresses on websites. I queried 7 or 8 producers and one very well-known producer who I cannot identify here, got back to me and wanted to shop the script around Hollywood. I let her but after a few months, she finally wanted to meet. At the time, I was in the Navy and nowhere near Los Angeles and when she found that out? She abandoned the script which was fine because it validated to me that I was on the right track when it came to both concept and writing. I kept sending the script out and eventually got some meetings and a few uncredited (do you see the theme here?) rewrites, tweaks, and polishes. I kept reading scripts and now screenwriting books were coming out so I devoured them for years until one day I realized that while I still had a ton to learn about the craft, wasn't going to learn it from reading any more books. And often, writing a blog post about some element of the craft is what solidifies my knowledge of it. I've read so much good and bad information... Read so many screenplays... Seen so many films that I have all this information bouncing around up here but it's not until I focus, think it through, and write it down that I finally get it. So The Unknown Screenwriter site is just as much for me as it is anyone else interested in the craft. I've found screenwriting to be one of the most challenging art forms I've ever worked in. Why is it so darn hard, and yet so satisfying at the same time? I think it's hard because it's so different from traditional writing. While it certainly does contain elements of traditional writing, let's face it... You can't write about what's going on inside a character's head and that's often what makes a novel so compelling and whether we realize it or not? It's what makes characters in a movie so compelling as well. As a screenwriter, we have to figure out a way to SHOW and NOT TELL i.e., through exposition, subtext, and action, we have to show what our characters are thinking. That's yet another perspective a lot of screenwriters don't seem to get. We're simply making the INTERNAL EXTERNAL. Once you KNOW how and combine THAT with a great concept YOU can commit to? You're going to start getting paid. You also write books. Was that a reaction to screenwriting, or something you've always done in tandem? I really don't write books. I've written two books. One about Blackjack and card counting and a novella, I guess you could say. It's not long enough to be a novel but it did come from screenwriting. I've always had this IDEA that a screenplay should make a great outline for a book so I took my last spec and used it as one just to see and I was right... Worked great and I would recommend this to anyone having a spec lying around. With it being so easy to publish a kindle book on Amazon, why not give it a try? Not to mention that I've been contacted for a few writing jobs just based on my book and author's page on Amazon. Having said that... I will definitely write another book especially seeing how the film industry climate is these days. I still have a hell of a lot to learn when it comes to writing a book and at this point in my life, it's best to just write. Write and learn. Your blog has been a popular resource for aspiring screenwriters. What made you want to support others in that way? Like I said before... I FEEL like I have a very different way of looking at this craft. I started writing before there were any books on the subject. All I did was try to mimic screenplays of movies I loved. I have no way to qualify this -- it's just a feeling but most everything I read about screenwriting -- the craft of screenwriting -- is very similar. And while that's fine for a lot of people, the proof is in the material. I can talk to someone who really seems to have a handle on their knowledge of screenwriting but then I'll read their screenplay and see that they've not applied all that knowledge to their spec. Upon questioning, I find out that they simply didn't completely understand that knowledge. The books, the workshops, the articles, and most of the blogs only go so far... Rarely do you find anyone really breaking it down into bits and pieces EVERYONE can easily understand. I think that's just something that I've taken with me when I retired from the Navy. We always had so many people from so many different places with so many different levels of understanding that we were often taught ways to break things down so EVERYONE can learn and not just a handful of people. I haven't blogged as much since my brother died a few years ago but I hope to get back to it soon yet the site still pulls hundreds -- sometimes thousands of visitors a day and I get emails almost every day from someone who tells me that they finally GET IT. That, in and of itself is very rewarding. If I can break something down for someone who's having a difficult time with some element of the craft so they can truly understand it and get back to writing? I love that! What do you consider ideal conditions for being creative? For me personally, it's taking a long drive or a long ride on my motorcycle. For whatever reason, I have my greatest creative epiphanies during these times. After that? It's sitting down in one of several coffee shops I patronize while I listen to music. 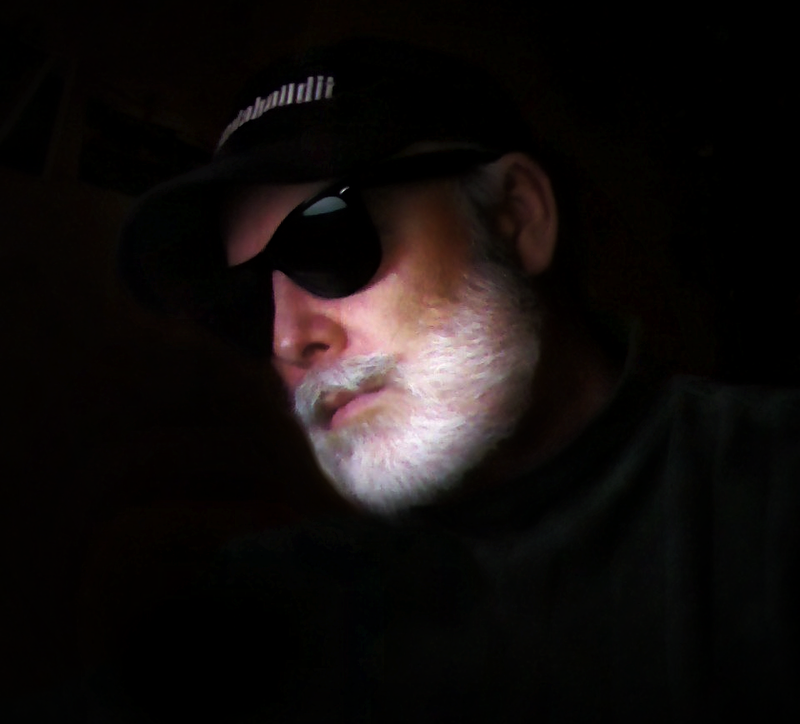 You will often find me dancing in my chair as I listen to music and write. When I'm moving to the music in my chair? The material just seems to flow. Any favorite screenwriters or influences? John Sayles hands down. He writes a book, then eventually turns it into a film. How cool is that? Michael Mann. Enough said. After those two, I've managed to meet and talk to a few heroes of mine but the biggest thing I noticed? And this is not a criticism by any means... I noticed we all put our pants on the same way. In other words, they're human just like me. They have problems just like me. The only real difference when it comes to screenwriting is that they get paid more... At least for now. Best advice for aspiring screenwriters? That's hard because what's best? I think if you want to write for a living and or sell something you've written, then you need to know up front that it really does come down to two SIMPLE PIECES OF THE PUZZLE... concept and execution. Execution comes the more you read and write screenplays and to a lesser degree, structure. A lot of beginning and aspiring screenwriters don't really understand structure. And while I'm not advocating one size structure fits all, I am advocating that you consider finding a structure you like -- one that works for YOU and become an expert on it. You can not only use structure to strategically place story elements in your screenplay, but you can also use structure to brainstorm plot twists and character arcs. Then, after your first draft is complete, you can go back to structure and use it to polish and tweak what you've written. Structure doesn't just have to be where you place story elements that elicit the most emotion from your audience... It IS THAT of course but it's also a nice big hammer you can use later hence, I mention it as part of execution. Concept is something not often talked about nearly as much. You really do need to spend just as much effort on your concept as you do writing the screenplay and hopefully, your concept is high enough for people in the industry to sit up and take notice. If your concept isn't high enough or different enough for anyone in the business to sit up and pay attention, then you'll either have to turn the screenplay into a movie yourself or realize you just spent 6 months writing something that probably isn't going to sell. And even making it yourself? If the concept isn't high enough or different enough? Fuhgeddaboudit. Will we ever get to know who the "Unknown Screenwriter" is? Who? Look... There's really no point in knowing who I am. I'm nobody. I'm everybody. I'm no different than anyone else and that's really the point of being the Unknown Screenwriter. I'm not trying to convince anyone of anything. Not trying to sell anyone anything. People are smart enough to KNOW if what they hear or read is correct when they hear it or read it. It either makes sense or it doesn't but even when it doesn't? Hopefully it clarifies something they already know about story to finally make sense. That's the way it should always be. 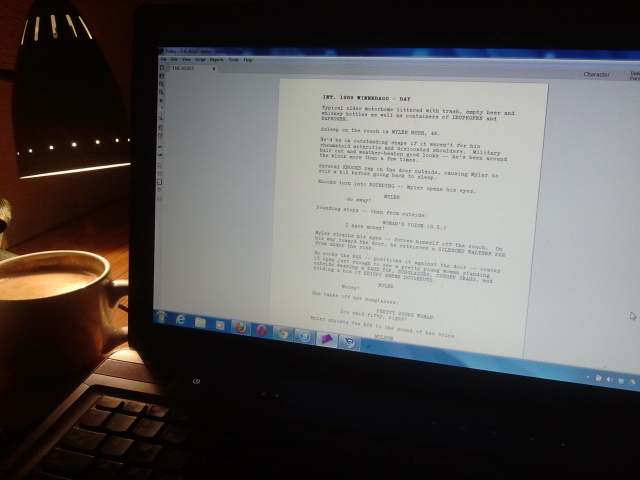 The Unknown Screenwriter is a screenwriter, producer, and script doctor for hire. He works with director Roland Joffé and a New York Times best-selling author that must remain anonymous as well. He enjoys riding his motorcycle extremely fast and the occasional triple of Wild Turkey.